Clever Bulletin: Tears of color - gift of God or the art? Tears of color - gift of God or the art? Eccentric artists are hardly hard to find, but Argentine Leandro Granato might be one of the quirkiest you'll see this week. He creates his paintings with tears, after snorting paint through his nose, he squirts it on to his canvas. 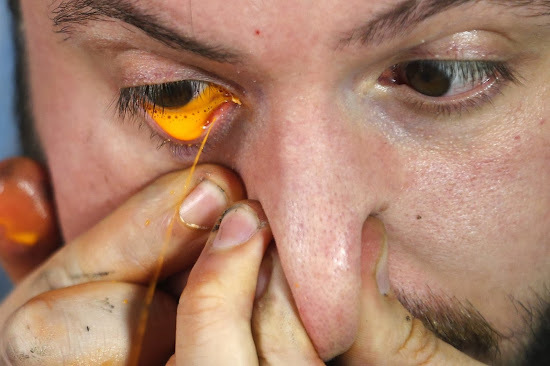 Obviously not an Evita fan, Granato, 27, from Buenos Aires records himself squirting the paint from his eye and sends the video to his customers, reassuring them it causes no pain. Each of his creations require around 800ml of paint and some have have been bought for £1,500. Crying-all-way-to-the-bank, Granato says his family thought he was going crazy when he started using his unique technique to earn a living, however they have come around to it now.